Delightful embroideries by our talented author Svetlana Babushkina is a true adornment to our magazine. Her sense of color and the fineness of work are very surprising. Svetlana Alexandrovna Babushkina lived in Moscow. She was born on the 10th of January, 1926, in the city of White Church near Kiev to a military family. She had two sisters and one brother. Two other brothers died in childhood from tuberculosis. The family had been caught up in World War II since the very first hour. Her mother saved their lives twice running away from the Fascists. After the war, Svetlana graduated from the Simferopol State Pedagogical Institute. Her husband, Vladilen Nathanovich Babushkin, is a veteran of World War II and a military retiree. 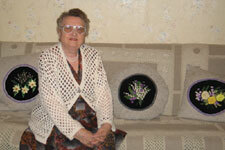 Svetlana spent many years with her husband in different cantonments of the Russian Far East. They have one daughter, Galina (that's me), two grandchildren, Vladimir and Katerina, and three great-grandchildren, Nikolai, Anna and Alica. The first things I saw waking up in childhood were mom's embroideries, hung on the walls of our room. Exquisite roses, splendid poppies and tender daisies were saying ‘good morning' to me. I was four or five years old then, but I can still remember that feeling of joy from the beauty that surrounded me. Our family lived in one room of a communal apartment. At the time, we lived in a cantonment near Lake Khanka in the Primorskiy Region close to the Russian border with China. My dad was on active duty as a tanker. Mom was always busy. I knew that she was a needleworker. Besides beautiful pictures on the walls, there were tablecloths, napkins, and pillows embroidered with cross- and satin stitches. I wore dresses handmade by my mom and decorated with her embroideries . Dad had a shirt embroidered by mom with small Ukrainian-style cross - stitches. Mom's own handmade clothing caused constant delight to all neighbors. Many women were embroidering at that time and there were exhibitions of needlework in our cantonment. Mom's embroideries constantly took first place on competitions. Her works were distinguished for style and exceptional skill; therefore, they were sent to other, more representative exhibitions. They won first prizes even in exhibitions of the Far-Eastern military district in Khabarovsk . Since then, we've kept a family relic – an inlaid jewelry box mom received as a prize for her wonderful work. Our cantonment was large with a nice Officers House where a lot of interesting events took place. If there was a ‘Calico Ball', then mom's striped calico dress won first place. On a ‘Pie Evening' her original recipes enraptured the most critical gourmets. Later she participated in culinary events as a panel judge. New Year masquerade balls were unforgettable. Costumes invented and made by such a creative person as my mom constantly caused delight to all participants and won the highest awards. For instance, a caricature published in ‘Ogonek Magazine' inspired the idea of a dual costume, ‘Modern Strauss Waltz', – then Chancellor of the FRG (Federal Republic of Germany), Strauss, famous for his bellicose statements, was dancing with an ‘A-bomb'. Another example of a dual suit was ‘The Fairy Tale about the Fisherman and the Gold Fish'. How could I not be proud of my mom's for her creativity! I'd been growing up and mom had been improving her skills in the different types of embroidering. She'd mastered knitting, crocheting and the knitting machine. At school, I took part in different activities, especially, dancing. All the costumes for my performances: Tatar, Chinese, Indian, Ukrainian, and Hungarian were works of art. At my wedding, I wore a white lacy dress knitted by my Mom. Of course, it was against all tradition – a bride wearing a knitted dress! But the dress was so beautiful that no other one could criticize this masterpiece of my Mom. I married Jacob, my childhood sweetheart, in Ryazan, where my parents lived at that time. Mom organized a club of cheerful guests and ready-witted hosts for each birthday, anniversary, wedding or other joyful event back there. They issued wall newspapers full of humor, kindness, and warmth. One of the club members, a former head of the Ryazan regional archive, still carefully keeps these homemade newspapers. The portrait I've drawn here probably looks one-sided. One may think that mom has never diverted her attention from needle and thread. Actually, she was a very active, hard-working and responsible person. She always worked in the library of the cantonments where we lived. Mom constantly participated in all community events and organized readers' conferences. For these activities she received many awards and obtained a diploma from the Central Committee of the VLKSM (The All-Union Young Communist League). Mom loved guests and always welcomed them with delicious pies and other perfectly cooked dishes. She was also a remarkable grandma and great-grandma! Jacob and our family lived in Novosibirsk, Siberia, and often sent our children to my parent's home during summer vacations. They always created such a wonderful time for their grandchildren. Now, they help to take care of their great-granddaughter, and, with the greatest pleasure, host their great-grandson from Siberia. Besides numerous relatives, there always were a lot of friends in mom's house and all of them are warmly welcomed and presented with unique gifts. When mom celebrated her birthday and held a hen-party, she prepared individual presents for each of her guests, embroidered with cross-stitches, satin stitches or ribbons. Then she made up a quiz and the guests took home gifts from her. Mom's latest hobby was ribbon embroidery. Unfortunately, she had lost much of her vision last years. Embroidering the finest satin stitches or smallest cross-stitches had become more difficult, but she could not live without embroidering. Ribbon embroidery provided her with new opportunities, inspired completely new ideas in creating pieces, where she used satin stitches, ribbon embroidery, and appliques all together. She constantly made up new images that in her hands took on color and volume. Of course, the primary connoisseur, the first critic and assistant in all mom's creative activities was my dad. He was always ready to create a chart for new embroidery, to make a frame or hang a work. That support was the most valuable of all to mom in her numerous activities. Staying in my parents' apartment was an encounter with beauty for me, my husband, my children, and my grandchildren. Also, this was a great pleasure for all my friends who can appreciate the beauty, taste, diligence, and cordiality of their hosts. In recent years many admirers of my mom's embroidery art could see some of her works published in special issues of ‘Fashion Magazine', a Russian publication devoted to needlework. Family and close friends were very glad that mom had received public recognition as a real artist. Now, new generations of needleworkers can use her knowledge and experience, and enjoy mom's excellent embroidery work.